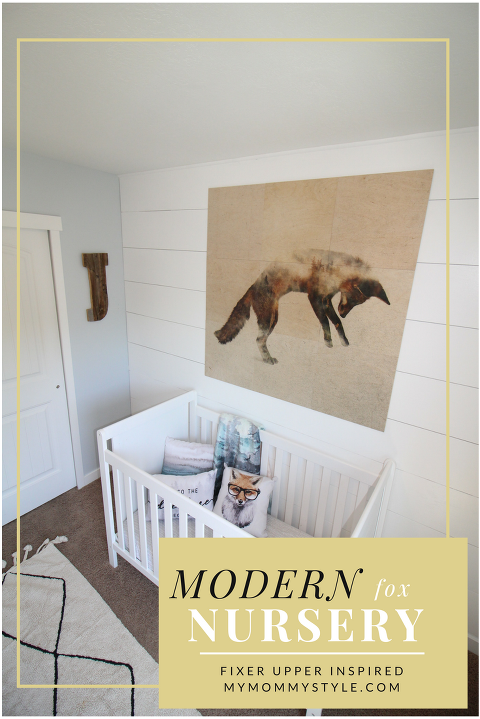 If you love the idea of mixing old with new, you will love this fixer upper inspired fox nursery. Classic lines, cozy textures, and beautiful art from Society6, will have you putting together this gender neutral fox nursery in no time. I am seriously obsessed with how well it turned out! Thank you Society6 for sponsoring this post. While this was a sponsored opportunity from Society6, all content and opinions expressed here are my own. This post also contains affiliate links which provides a small commission for us, but in no way changes the cost to you. Thank you for your support! I have always had a love for things old and new. When I found this old, gold framed mountain view, I fell in love with it instantly. Nature has always been a way for me to connect with God and helped me feel calm and at peace. I grew up in a home surrounded by trees, so this old classic really spoke to me. I also love mixing modern pieces with old furniture that is filled with history of previous owners, Knicks and dings of people who loved the furniture before and the stories they could tell. With that being said, I love modern pieces, I love clean lines, I love seeing new art, and I love seeing a new twist on something old. I guess you could say I was inadvertently inspired by the popular show, “Fixer Upper,” when I decided I wanted to try to include this art into something new. It has been in my nursery for four years now, and as much as I have changed the rooms, this picture has remained. It wasn’t until I found Society6.com that I was really able to bring this art to life the way I wanted to, with the help of other artists. I was like a child at the candy story feasting my eyes on so many possibilities. I was able to take my antique painting and find throw pillows, a blanket, and an incredible piece of fox art that brought the room together in a whole new way. I literally scrolled through hundreds of options for art. The hardest part was narrowing down my favorites because there were so many. It is like a hunt finding the perfect equation of what art pieces would compliment another. Any piece of art you find on Society6.com helps to support the artist who designed the art and you can also turn it into just about anything you can imagine that would decorate your living space. The first place we started when redoing the room was to replace our DIY vinyl triangles. 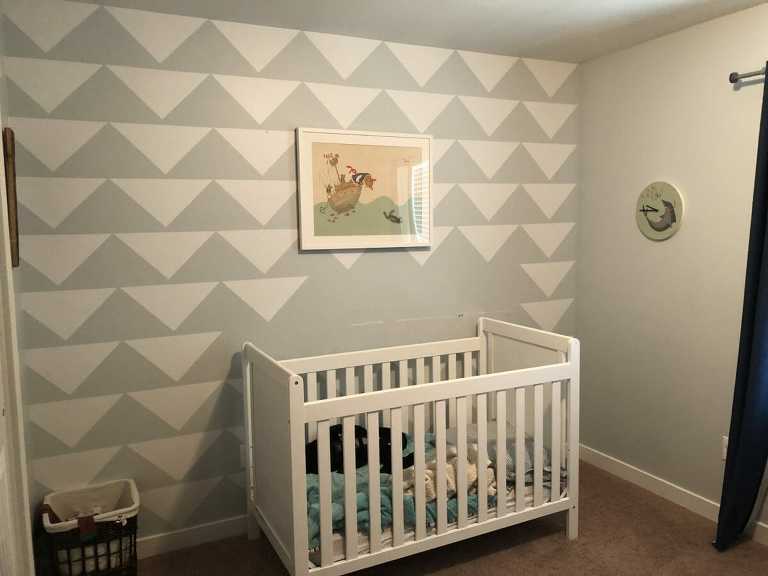 They were well loved, so much so that my son peeled all of the triangles off the wall around his crib! *stinker. I wanted to take the look of shiplap and modernize it a bit with wide, sleek lines. Thank goodness my husband is a measuring genius, because I am sure I would have messed it up. I will be sharing a DIY on that later. This is what it looked like before: ouch. I love the idea of shiplap, but I wanted to make the planks bigger with sleek lines to modernize the space a bit. Once I had a blank space to work with finding the perfect focal point was the goal. Now, when you find something that you really like on Society6 you can turn it into a throw pillow, a rug, a wall hanging, a t-shirt, wallpaper, framed art, or even a cell phone cover! So really, whether you’re looking for a clock or a new beautiful mural for your wall, Society6 will have a way to fill in any empty space that needs filling in a beautiful and unique way. You can find this gorgeous jumping fox wood Wall art by Andreaslie HERE. This wood tiles come in all different sizes, the smallest being a total area of 3’x3′, what I ended up picking out was a 4’x4′ because I really wanted it to fill out the space well. We made sure to make these pieces individually very secure with screws and 3M strips. I was considering doing a mural, which is a much cheaper option for a big impact, but I knew my son, “sticker picker” would definitely pull it down. This wood tile option gave the room the big impact without being one giant piece that I would worry about falling down. We made this EXTREMELY secure and I love the size and the impact! Could you just die over the colors of this blanket? It is the softest material you can imagine, think minky fabric meets silk, and I love the dreamy effect of the blues. I decided to make this piece of art into a blanket so that it wouldn’t compete with the painting I already have. I loved bringing the blue into the bed and I think this will be a favorite taken all around the house. This piece of art almost became my main focal point above the crib, but I decided to turn it into a pillow instead. I love the simple black and white of the pine trees, it is very neutral and would go well with so many different types of decor. Within the Tides Pillow: Again, I love the blues that are pulled into the bed with this pillow! I love this pillow, it could go just about anywhere! And this is the “After!” I love how it turned out! Even Poppy loves his cozy new spot. I hope that you were inspired by this post today! 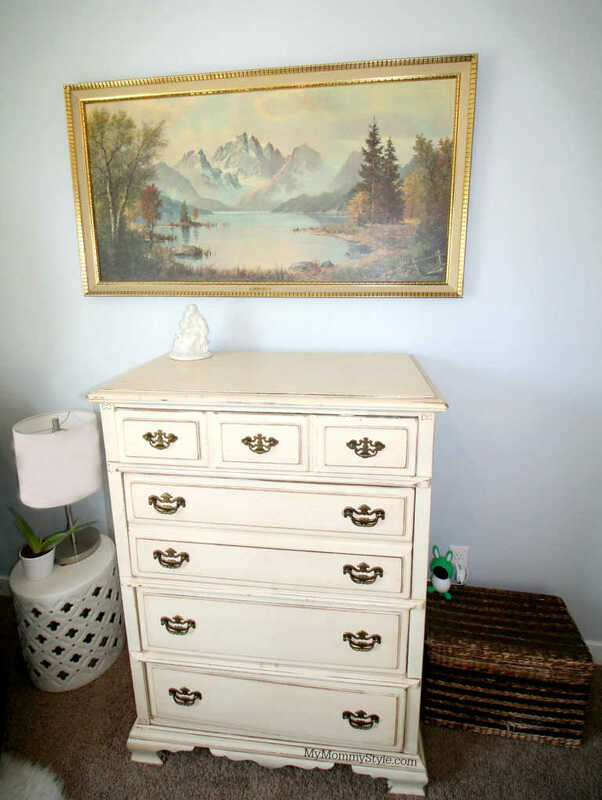 I find the best part of decorating is finding pieces that inspire you and make the room YOURS. Don’t worry about “the rules” or what you think others would like. Do you what you would like, I guarantee you can find something(s) you will fall in love with on Society6! Keep your eye out for specific sales on wall art, throw pillows, and other items, Society6 is always having a sale!